In the 1920's mechanical toys were all the rage and because of their elevated price were bought by the elite. 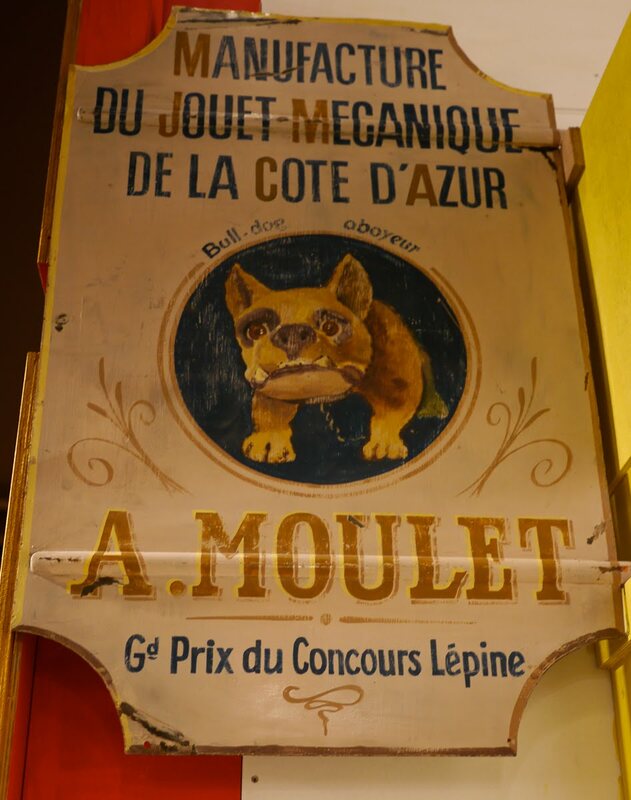 One Menton company, Aristide Moulet, made mechanical dogs as much for adults as for children. Dans les années 1920, les jouets mécaniques étaient à la mode mais leur prix élevé ne les rendait accessibles qu'à la bourgeoisie. Une manufacture Mentonnaise, Aristide Moulet, fabriquait des chiens mécaniques pour le plaisir des adultes aussi bien que pour celui des enfants. 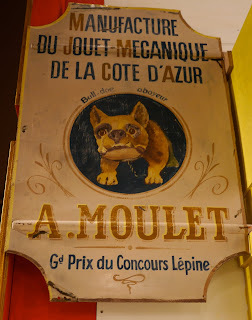 Bouledogue francais, what else?! I think he's cute. Apparently, if it were working, he'd bark. 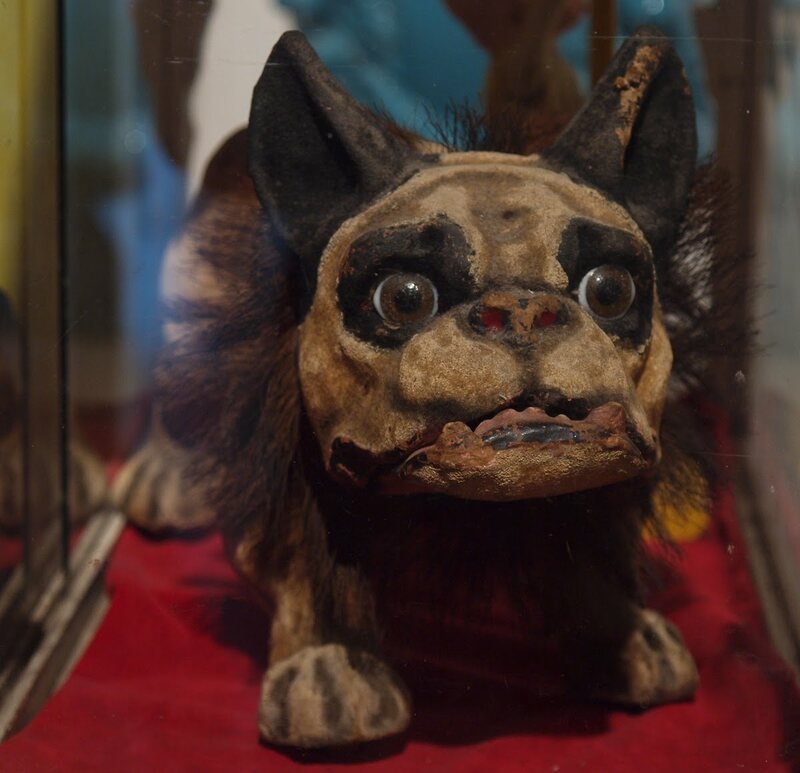 I had a little dog with a battery in it when I was a kid. It walked a bit, stopped, wagged it's tail and barked. I loved it! Your first photo, the intense straight-on close-up, is terrific! I agree with Jack... plus it is a bit frightening! Hope that you had a great weekend and will post photos of your Saturday. Arf! Arf! 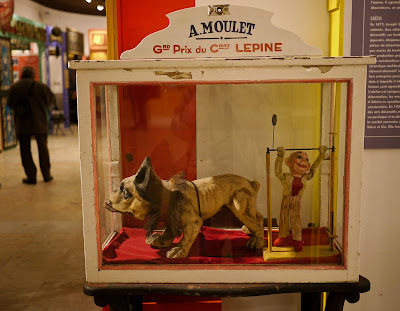 A wonderful portrait of a mechanical dog. thanks for taking and posting these, Jilly, first we get to know what we missed, and then, we don't actually have to miss it after all!